In Life. In Love. In Food. If ever there were a day to describe as bittersweet…today would be it. Today is a bittersweet day of firsts. Today is my first day back to work. Today is Bella’s first day at daycare. Today is the first day of Bella’s future friendships. Today is the first day I go out knowing my heart is somewhere else! It is amazing to me that my emotions are all over the place. Nervous – to leave my little girl. Excited – to be back at work. Ambitious – to be successful in my career and as a mom. Anxious – for there is so much work to catch up on! Sad – that time flies by so quickly. But mostly….mostly I am overwhelmed with gratitude and love. I feel very blessed to be Bella’s Mom….blessed to be experiencing this bittersweet day. I am not the first…and I certainly won’t be the last to experience this “dreaded day”…so instead of tears this morning, I smile and look forward to 5pm more than ever before! To celebrate this new beginning, Ryan and I are sharing another one of our new obsessions with you. Over the course of my maternity leave, we’ve come to love the combination of Roasted Red Pepper…Goat Cheese…Carmelized Onion…Spinach…and Garlic! 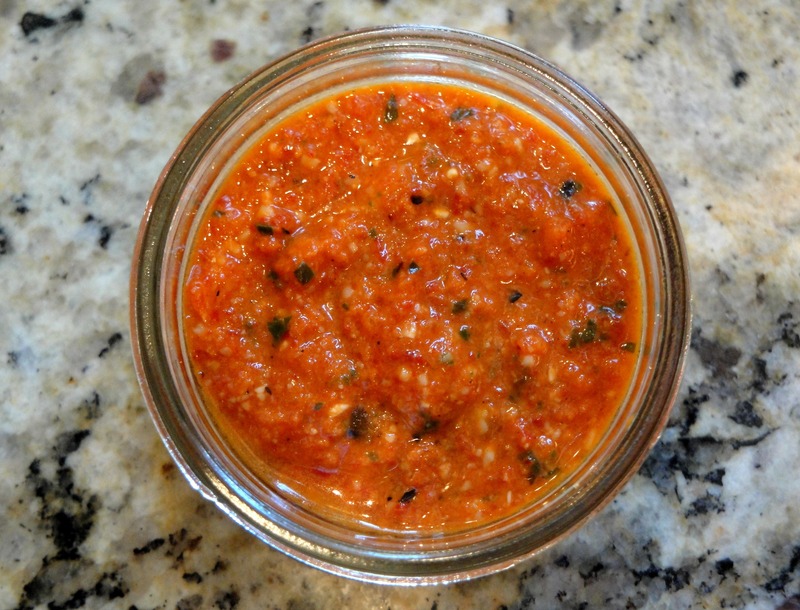 We’ve enjoyed homemade Roasted Red Pepper Pesto (Thanks to one of my FoodNetwork favs, Bobby Flay! )…an Omelet inspired by Hotel Monaco in Seattle, a new Boudreau Homemade Pizza, and an amazing pasta we created with all of the ingredients above! In the next few posts, I will share all of this new creations with you. I hope you can appreciate this new found love for Roasted Red Pepper (I think it all started with the Roasted Red Pepper Chicken Sandwich!). To begin this tour of Roasted Red Pepper favorites, we need to start with Bobby Flay’s Pesto. Run to the grocery store, pick up some red peppers (they are HUGE right now! ), some fresh basil, and whip up some pesto this week. Preheat an oven to 375 degrees F.
Put the peppers, garlic, basil and pine nuts into the bowl of a food processor and pulse until coarsely chopped. With the motor running, slowly pour the olive oil through the feed tube and pulse to emulsify. Add the cheese and salt and pepper, to taste and pulse a few more times just to combine. Scrape the mixture into a bowl. Once you’ve tackled the pesto, you will be wondering what to use it on first. So, I say… it is time for pasta! I happened to have all of these ingredients on hand, so I created the pasta below. I hope you enjoy it as much as we did! 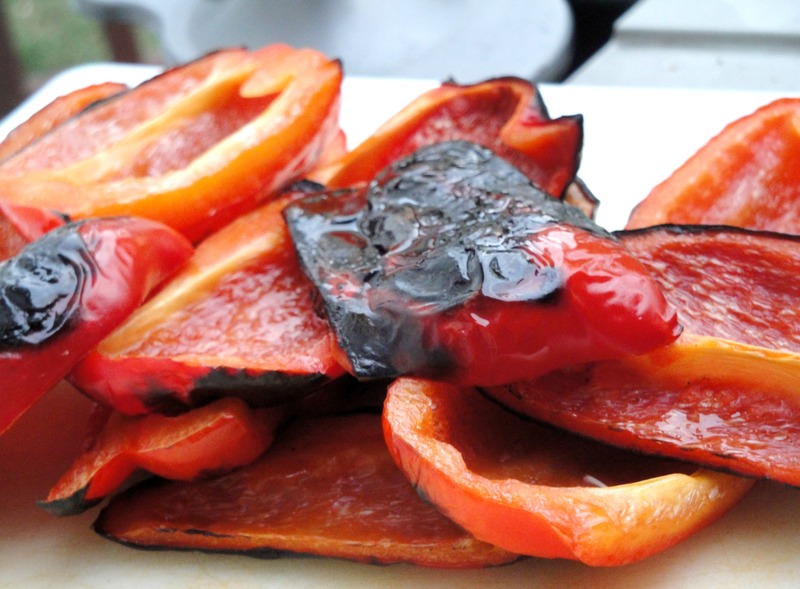 Begin by roasting the red peppers (just as you did for the pesto above). Once roasted, peel, slice & set aside. Once the peppers are complete, prepare your chicken breast. Sprinkle the breast with salt and pepper, rub with extra light olive oil and grill at 400 degrees for 6-7 minutes on each side, or until cooked through. (As an alternative to olive oil, I marinated mine in a jarred bruschetta sauce for 20 mins for extra flavor!) Slice and set aside. In a small pan, add 1 tbsp EVOO and saute onions until slightly softened & translucent. Remove from heat and set aside. In a seperate pan, add 1 tbsp EVOO and saute garlic and spinach until the spinach begins to wilt. Remove from heat and set aside. In a small pot, boil penne until al dente (~8 mins). Strain noodles and return to pot. 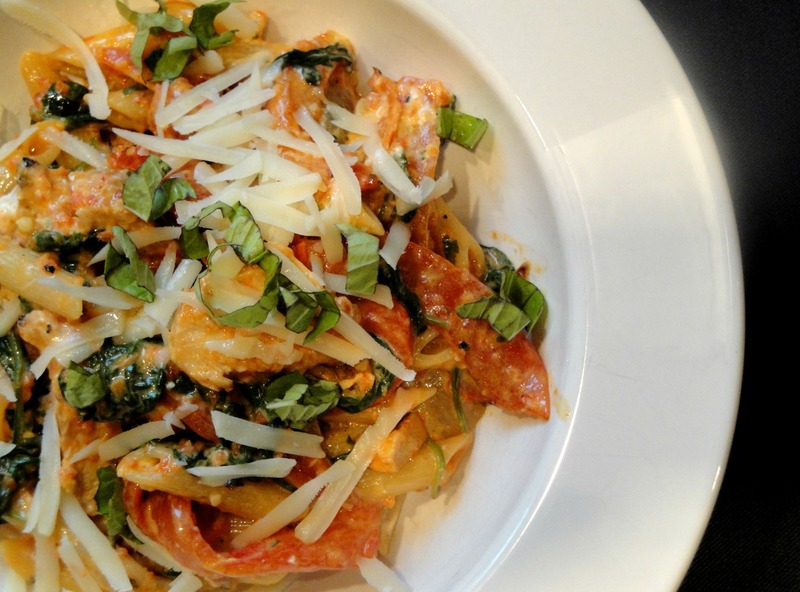 Over low heat, combine all of the ingredients (pasta, peppers, onions, spinach/garlic mixture, chicken, and goat cheese). Add 4 – 8 oz of pesto depending on just how “saucy” you like your pasta! Heat through. Serve immediately and top with a sprinkle of freshly grated parmesan and fresh basil (optional). Pair with a glass of Sauvignon Blanc and enjoy! To a day…and week of bittersweet beginnings…CHEERS. Indulge. In Life. In Love. In Food. « Older Post Italian Chicken Soup	» Newer Post I’m Still Here…Chicken Soup & All! I'm Robin and I thank you for visiting! My name is Robin & I'm encouraging you to indulge in life, in love, and in food. Many of these recipes aren't for calorie-counters, but I believe richness, indulgence, and elegance has its place too. I love my work but in my free time, I also love to cook, host family and friends, travel as often as I can, and then simply relax at home. Through this blog, I hope to share some of my indulgences with you! Enjoy. Delivering Pumpkins…and Caramel Apple Cheesecake Bars! Spicy Salmon to Celebrate a Decade with Ruby!